This was one of the better vampire TV series of recent memory, and I gave it 3 out of 4 stars in my book, Un-Dead TV: The Ultimate Guide to Vampire Television. Now's a good time to get reacquainted with this series; the collector's edition DVD is available April 22. Unfortunately, they're only releasing a PAL, region 2 DVD set, which isn't watchable outside of Europe. Dark forces are at work in Ultraviolet, the gripping modern-day vampire drama which comes to DVD courtesy of Mediumrare Entertainment. Starring Smash's Jack Davenport and True Blood's Stephen Moyer, Ultraviolet aired on Channel 4 to rave reviews in the late 1990s and it will be available on DVD on 22 April 2013. Ultraviolet brings the world of Vampires bang up to date as it follows the exploits of a covert government unit, who must track down and destroy Code 5 infected subjects. Detective Sergeant Michael Colefield (Davenport) is unwittingly thrust into the nightmarish world of vampires when his best friend Jack (Moyer) disappears on the eve of his wedding to Kirsty (Collette Brown - Doctors, Holby City). His investigation leads him to uncover a secret Government organisation that hunts vampires, and Jack has become one of the hunted. Michael reluctantly joins the team which includes a soldier Vaughn Rice (Idris Elba - Luther, The Wire) scientist Angela March (Susannah Harker - Waking The Dead, Intimacy) and a Catholic priest Pearse J Harman (Philip Quast - The Devil's Double, Clubland). Armed with an artillery of the best weaponry the team investigates cases ranging from a woman who appears to be carrying a vampire child, a man who is being used to test synthetic blood for vampires, and the outbreak of a vampire related disease at a school as well as dealing with the consequences of their job. 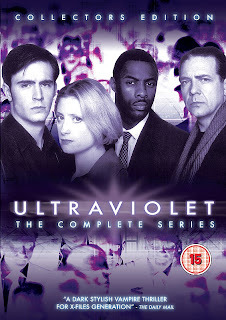 With a sterling cast and nail-biting stories Ultraviolet is British Sci-fi at its best. Special features include: brand new retrospective of making of Ultraviolet.